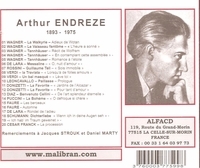 "Arthur Endrèze was born Arthur Endres Kraeckmann in Chicago where the conductor Walter Damrosch discovered his beautiful voice and recommended him to study singing. It was not until 1928 when he came to France by way of the American Academy at Fontainebleau. While there, he took instruction from Jean de Reszké and began a career as a recitalist. He made his opera début in 1925 as Don Giovanni at the Nice Opera House. It was the composer and baritone Reynaldo Hahn, who invited Endrèze to appear in some opera performances at Cannes and Dauville. He débuted as Karnack in Lalo’s LE ROI d’YS at the Opéra-Comique in 1928, followed by the first appearance at the Grand Opéra as Valentin, where he created a variety of roles of French contemporary operas. The most successful creation was the title role in Magnard’s GUERCOEUR. In 1937 he took part in the first performance of Honegger/Ibert’s L’AIGLON. Endrèze was the leading baritone at the Grand Opéra for almost 20 years where he enjoyed a remarkable success in the title-role of Méhul’s JOSEPH. During his entire career he was also a frequent guest at the operas of Nice, Brussels and Monte Carlo (he never appeared in the United States).